With the passage of legislation in Congress, social media devoted more attention to the health care reform last week than it had at any point since the legislative battle over the issue began last spring. On blogs, Twitter, and YouTube, the issue overwhelmed all other subjects as Internet users shared their reactions to the bill and then focused on the heated discussions that surrounded the protests. 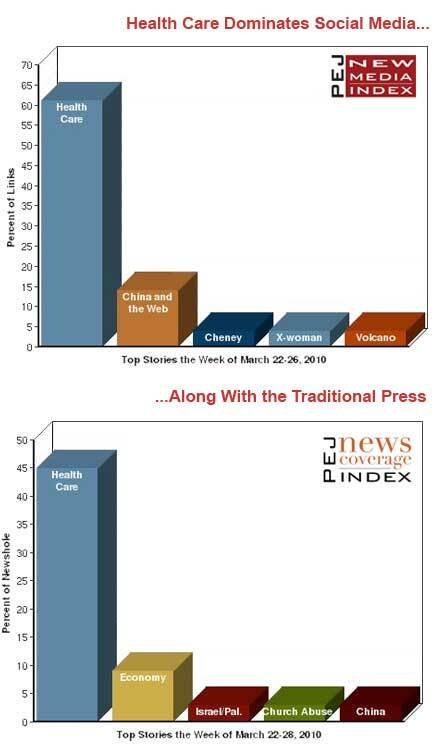 From March 22-26, fully 61% of the week’s links in the blogosphere concerned health care, according to the New Media Index from the Pew Research Center’s Project for Excellence in Journalism. That was the largest level of attention the subject has received since PEJ began monitoring social media in January 2009 and was five points higher than the week before, which had been the previous high. 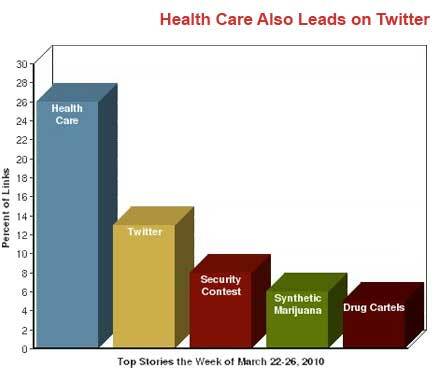 On Twitter, 26% of the links were about health care, also the most attention to the subject on that platform since PEJ started tracking the site in June 2009. The issue was also the subject of three of the top five most-viewed news videos on YouTube. The pattern mirrors, incidentally, what we found in traditional media-that the debate over health care reform received its highest attention following the bill’s passage. In the hours immediately following the vote in Congress-on Sunday March 21-both supporters and opponents of reform wanted to air their feelings about the bill and specific components of it, often in dramatic terms. But the debate quickly changed once reports surfaced that Tea Party protestors had directed insults at members of Congress who supported the bill, and after the vote there had been incidents of vandalism and threats to lawmakers. At that point, the discussion in social media began to focus on the tone of disagreements as much as it did on the reform itself. Many bloggers also concentrated on the politics of the bill, some of which focused on a poll released after its passage giving hope to supporters that public opinion had turned in favor of reform. After health care, the second-largest subject on blogs, at 14%, was a story with ramifications for both technology and interests abroad-the situation involving major Internet companies and China. After China moved recently to limit free speech online, two of the world’s largest Internet companies pushed back. The search giant Google announced it would no longer cooperate with China’s censorship demands. And the world’s largest domain name registration company, GoDaddy, announced it would stop registering domain names in that country. This is the second week in a row that social media had paid significant attention to this controversy. It was the third-largest subject on Twitter the previous week. The mainstream press, by contrast, devoted 2% of its newshole to the story last week according to PEJ’s News Coverage Index, but not nearly as much as the blogosphere. A number of bloggers viewed the conflict between one of the world’s largest countries and two Internet giants as a clash with broader implications. Bloggers overwhelmingly supported the moves made by Google and GoDaddy and expressed hope the actions would lead to more openness within China. Finishing third, at 4%, was a Washington Post article from 2004 about then-Vice President Cheney using foul language in an exchange on the Senate floor. The story gained attention last week, almost six years after its initial publication, in response to current Vice President Biden’s use of the same word at a press conference celebrating the passage of health care reform. Fourth, also at 4%, was the discovery of a previously unknown type of ancient human dubbed "X-woman" through DNA analysis from a finger bone found in a Siberian cave. And the eruption of a volcano near the Eyjafjallajoekull glacier in Iceland was fifth at 3%. On Twitter, the second-largest subject was Twitter itself with 13% of the week’s links. These included several stories about the site including a first-hand account of a meeting called the Twestival where people in more than 175 cities coordinated ways to raise money for charities using Twitter. The annual Pwn2Own contest where security analysts hacked into popular software programs and products such as the iPhone and Internet Explorer 8 was third at 8%. That was followed by a story about the dangers of synthetic marijuana known as K2 or spice at 6% and a report about the expansion of Mexican drug cartel activity into the United States at 5%. After the House passed the health care reform bill, many bloggers linked to news reports from such sources as The Washington Post or the BBC and shared their thoughts about the legislation. "The Democrats finally achieved victory to reform this nation’s health care system after decades of efforts," cheered Sisyphus. "The…bill…may not have been as sweeping as many Americans had hoped for but it moves this nation ever closer to universal coverage, closer to controlling escalating costs, and away from insurance industry discriminatory practices." "Sounds pretty good to me, particularly the part where insurers can’t deny coverage based on pre-existing conditions," added Katharine Swan at Proud Diabetic. "I really think that if people would stop freaking out about the cost (which really isn’t that bad, since they are cutting unnecessary spending on Medicare and increasing taxes on the wealthy to pay for it), they would find that this benefits them far more than it hurts anyone." Opponents used social media to express fear and outrage. "The democrats have issued a declaration of war against the American people with legislation designed to insinuate the government into each and every healthcare issue," warned Steve at One Citizen Speaking. "We have no choice but to fight against those politicians who have placed America at risk." A number of Twitterers focused on a CNN report about tax penalties people might face if they do not have insurance. "Some may face penalty for shunning health insurance (via @cnnbrk). #Healthcare is the new Bolshevism, komrades!" tweeted dbjohnson. "Hm….Not sure if I dig being penalized via tax code for not wanting to get Health Insurance. (Any truth to this?)" wondered Dan Kalbacher. But while disagreements about the value of the bill were taking place, some of the online conversation shifted to the nature of the disagreements that were taking place at protests around the country. After the Washington Post reported that members of the Congressional Black Caucus claimed racial epithets were yelled at them by conservative activists outside of the Capitol, some bloggers focused on the nature of the anti-reform protestors in general. "Now that we’ve witnessed ignorant and angry adherents of the Tea Party movement shouting racial and homophobic epithets at their duly elected representatives-not to mention deliberately disrupting the political process and threatening violence-it’s not so funny anymore," condemned Citizen Jane at 46 Degrees North. Some supporters of the Tea Party movement felt the media coverage of the incidents, if they did in fact occur, was disproportionate. "The malicious treatment of the Tea Party movement by elements of the media establishment in the wake of last weekend’s health care protests is just stunning," critiqued Colin at To Get Rich is Glorious. "I suspect these disturbances and the alleged racial epithets have been accorded such heavy coverage largely because it dovetails with the popular narrative of Tea Party protesters as kooky, racist simpletons." This narrative, debating the character and intentions of the people on both sides of the health care debate, continued as reports of vandalism and threats against members of Congress who supported the bill arose later in the week. "This is only the latest proof that the Tea Party has attracted radicals that have crossed the line from highly obnoxious behavior…to acts of violence that could endanger the public," denounced Fernando Espuelas. "With death threats being made…we are certainly in a dangerous moment for our country." "The world is changing," posted Bruce Gerencser at Restless Wanderings. "Their [the protestors] stranglehold on America is being loosened. Their power is fading. And so they fight back the only way they know how…with violence." A few bloggers who supported the anti-reform protestors also condemned the violence. "Why is our Side so STUPID!" wondered GOP Skippy. "All this does is feed into the media’s bias, it lets them paint all Republicans as crazy, violent extremists." Despite all the controversies, supporters of health care reform were buoyed by a USA TODAY/Gallup Poll released after the bill was signed into law showing a plurality of voters saw the bill as a good thing. "But today, I’m newly-baptized in the faith of progressive legislative process," applauded Tom Watson. "So I’m breaking out my old Mao T-shirt and cussin’ like Vice President Biden. This hopey change thing seems to be workin’ out just fine right now." "Finaly health care in US 4 everyone," tweeted Miss G.
Health care reform was also a major topic on YouTube last week, the subject of three of the top five most-viewed news videos. The third clip was a brief nine-second excerpt from a House committee meeting in which Representative Alcee Hastings (D-FL) says, "When the deal goes down, all of this talk about rules-we make them up as we go along." Opponents of health care reform, including the office of House Minority Leader John Boehner (R-OH), pointed to the quote as evidence of a ruthless legislative process used by Democrats in which there were no rules. And the short excerpt went viral as a denunciation of Hastings. The blog Mediaite revealed that the excerpt is actually a quote from Thomas Edison, which Hastings was using in part to criticize the financial leadership of Republicans when they controlled Congress. The brief nine-second version, Mediaite argued, is misleading without the rest of the Hasting’s statement to accompany it. The shorter version, however, was the one that became the No. 3 clip on YouTube. The fourth video is a nine-minute piece created by a liberal group called New Left Media, in which the host juxtaposes interviews with Tea Party protestors with shots from the Barnum & Bailey’s circus. The interview subjects appear to know few specifics about the health care bill being voted on in Congress and the clear intention is to make them come across as uninformed. This is the second time that a video by New Left Media has made the list of most watched videos. Last November, the group posted a similar video featuring people waiting in line at a book signing for Sarah Palin. The fifth video comes from an incident at a March 17 Tea Party rally in Columbus, Ohio, in which a group of health care reform opponents openly mocked a counter-protestor who had Parkinson’s disease. According to Progress Ohio, the blog that was responsible for posting the video on YouTube, the original footage was shot by a reporter from the Columbus Dispatch. Several days after the incident and the video was posted online, one of the men involved named Chris Reichert apologized for his actions. 3. A brief C-SPAN clip of a meeting on health care where Representative Alcee Hastings (D-FL) says, "When the deal goes down, all of this talk about rules-we make them up as we go along." Early last week, Google announced it would no longer participate in China’s Internet censorship which drew condemnation from the Chinese government. Google made the move to redirect all traffic to its open Hong Kong search engine rather than the restricted one that had been in use on mainland China. Bloggers overwhelmingly supported Google’s decision. "It really is a shame that China’s government lacks self-confidence and is too immature to admit mistakes and have an open and free internet," wrote Kris Fedorak. On Wednesday, GoDaddy announced it would no longer register domain names in China due to new rules imposed requiring people to provide more personal information to obtain a site. On the heels of Google’s decision, bloggers saw the situation as a large conflict between major parties that had the potential to influence China’s stance on information. "The ongoing battle between Google and China sometimes reads like a spy novel, featuring a giant technology company clashing with a cadre of totalitarian overlords, attacks by hackers apparently aimed at pinpointing citizen activists and dissidents, and grandstanding speeches by senators and congressmen about the Chinese threat," described Matthew Ingram at Gigaom. "GoDaddy and Google appear willing to stand up to China on freedom of expression," detailed Cory Allen Heidelberger at the Madville Times. "I look forward to seeing whether this private economic sanctions effort wins more support and effects change in China." "Censorship and government repression have gotten worse in China since the Olympics," added J.N. at the Train of Thought. "Hopefully this is the start of a larger reaction to that from the rest of the world."